OTTAWA September 18, 2012 - Canadians and their governments wrote the book on how to tame deficits in the mid-1990s - and American politicians should look north in their 2012 election for guidance as they struggle for public support to balance Washington's budget, a new book published by the Macdonald-Laurier Institute says. 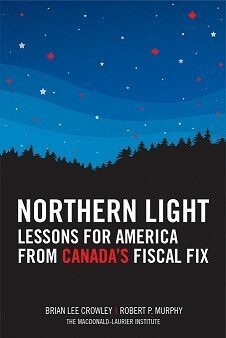 In Northern Light: Lessons for America from Canada's Fiscal Fix, Brian Lee Crowley, Managing Director of the Ottawa-based Macdonald-Laurier Institute, Nashville-based Robert P. Murphy, Principal at Consulting By RPM, and Fraser Institute President Niels Veldhuis conclude all American office holders are fully aware of the tough medicine needed to heal a fiscal crisis that is only getting worse. But they fear the political consequences. Their fears are unfounded. Canada's muscular budget reforms of the 1990s should point them to a way out of fiscal crisis that is both economically sound and politically feasible, the authors conclude. Austerity is a toxic topic for politicians everywhere because of the potential political consequences. But the authors say the Liberal deficit elimination of the 1990s proved two things: Austerity doesn't have to be politically painful if done well and deep cuts should be done forcefully and quickly so that economic benefits can be gained almost immediately. The U.S. federal debt is headed to the danger zone of 90 per cent of GDP within a decade while the current federal budget deficit exceeds $1 trillion. But Canada had a fiscal crisis in the mid-1990s that was in many ways worse than what the U.S. is facing today. Ottawa had run substantial deficits for 20 straight years. As a result, a third of all federal revenues were going to simply pay interest on the debt. The Wall Street Journal concluded in January 1995 that Canada was near bankruptcy and the government was desperately trying to get the debt and deficit under control. Still, the Liberal government of Prime Minister Jean Chrétien was able to turn things around in a mere three years. It put the federal balance sheet on course to 11 straight annual budgetary surpluses while easily winning two more elections. The American Enterprise Institute and the Macdonald-Laurier Institute are jointly holding an event today, Tuesday, September 18 at 2 p.m. (Eastern), in Washington on how the Canadian turnaround was done. Former Canadian Prime Minister Paul Martin, who served as finance minister during the turnaround, will be keynote speaker. The event will be live streamed. Click here for more information. "The United States is in a vicious cycle of debt," said Dr. Crowley. "But this can be replaced by a virtuous cycle of surpluses that can lead to tax relief, which in turn will foster economic growth." What might surprise Americans and Canadians alike is that the Canadian measures were far tougher than either the Bowles-Simpson proposal or the 2013 House Budget Resolution - the so-called Paul Ryan plan. For example, neither plan would actually cut absolute federal spending. In Canada, federal spending as a percentage of GDP fell from 21.5 per cent in 1994 to 15.2 per cent in 2004. - Lose the partisanship: Progress on the deficit was only possible because Canadian political parties ceased to treat it as a partisan issue. - Everyone has a stake: No playing favorites or carving out exemptions for political friends. If fixing the deficit is a challenge for the nation, then the whole nation has to be called on to contribute. - Time is of the essence: Proceeding piecemeal would have only delayed the handsome pay-off that Canadians received once the back of the deficit was broken. - Easy target: A simple, easily understandable target is crucial for public support. Eliminating the deficit was Job 1, and Canadians eagerly awaited progress and took pride in reaching the national goal. call (613) 482-8327, ext. 105. *Please note: This is a corrected version of the September 18th media release. Co-author Niels Veldhuis's name was inadvertently left out in the original version of the release. 1990s, budget, Canada, deficit, U.S.